Your workspace should be arranged like a mood board. 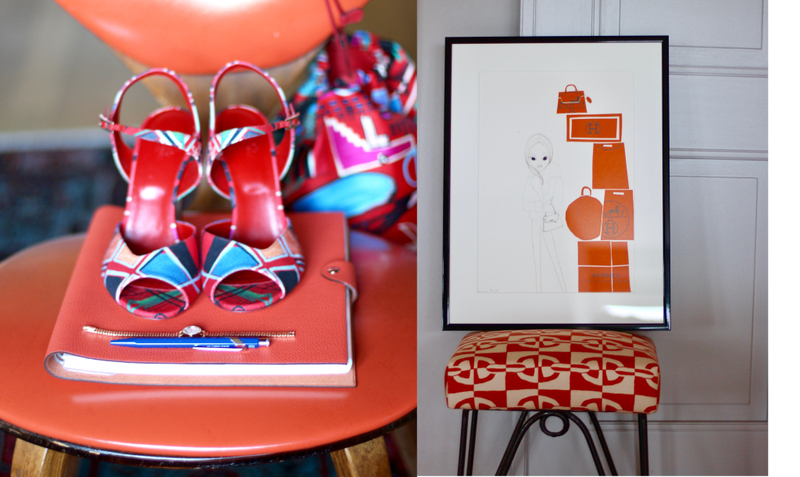 We took silk covered sandals by Hermès, a pretty diary and an IRMA illustration to get into the mood for a new project. Here we go, the year starts with all the good intention to declutter your desk and get motivated at work. Arrange things differently and light up your favourite scented candle to get back on track. Read about what IRMA will do. For most of us the office desk is the centre of work during the day. 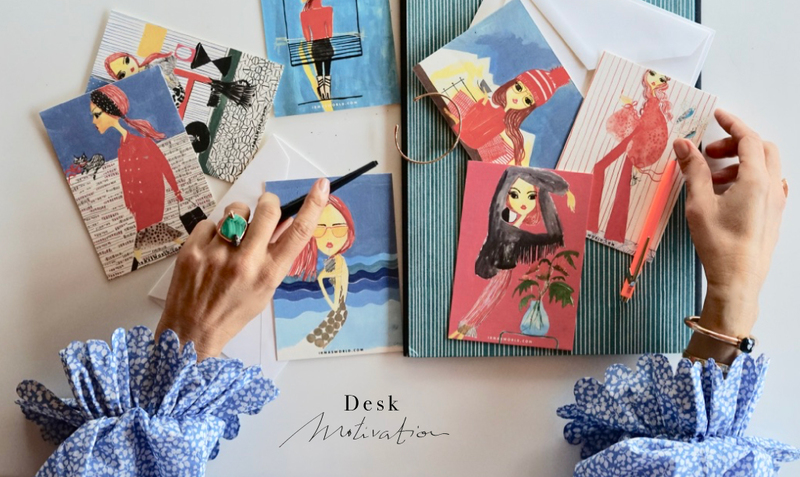 Have you ever considered your desk to be the mood board for something you are working on? 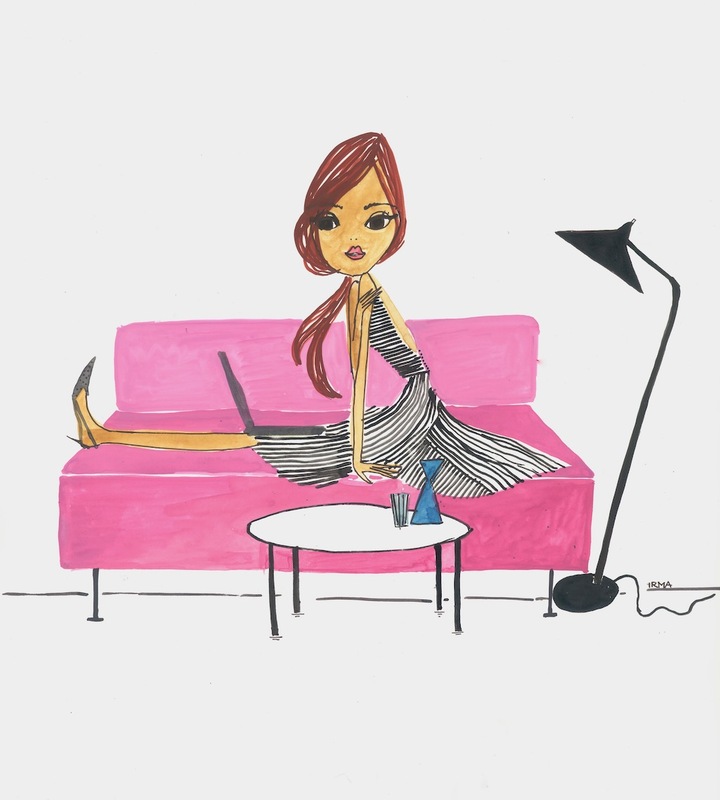 Surround your workspace with simple, visual pleasures, like an art print, a cool notebook or beautiful calendar. Make sure that everything on your table inspires you for your current work. Start your office day with something nice. Do not immediately look at your email but visit a favourite website for news and inspiration, or Pinterest to put you in the right mood. Make sure that you do that just for a short limited time, so it remains a. Make sure you have funny moments. Especially when you work for or by yourself, you can often go throughout an entire day without laughing. This is contra productive for your creativity and your health. Make sure to have a good laugh at least once a day. Let music do the thinking, because music is a powerful influence for your mood and work. Find a song that captures your current intentions or aspirations. Listen to IRMAS MUSIC on Deezer. Our DJ Maggy Smiss is brilliant. Post your goals! They need to be visible. Write everything you want to achieve in a week on a sheet and see by Friday how far you got. Prioritize, because many people make the mistake of doing lots of tiny tasks at the beginning of the day, which makes you feel tired and uninspired when the bigger, more important tasks arise. Do it the other way around, start with the big, daunting things at the beginning of the day when you’re fresh and energized. Because accomplishing something significant adds energy to the rest of your day. Think about the people you admire. Have any of them written books or given talks you can look to for inspiration? Why do you admire them? Then draw on those traits as a source of inspiration for your own job. Pretty sleeves make office work a pleasure with this blouse by Horror Vacui and some jewels by Pomellato on your hands, postcards set by IRMA.